It's the end of the 52nd week of the year. This means two things; this week heralds the final #secretsofselfpreservation potion this year (and indeed, ever, unless I do some more #secretsofselfpreservation workshops) and getting a large chunk of my Sunday back each week to make a wide variety of art or to do whatever I fancy, really. I have a new project brewing which leads on from #secretsofselfpreservation but goes off on much more tangents. I feel like I have been floating around on a cloud of Christmas spirit the past few days. It could be having more than one day off work for the first time since April (ten whole days, I'm ecstatic! ), it could be that I've spent time with all my favourite people, or it could be that, looking back on 2015, I am certain that it was one of my best yet. It may be something of a cliché to think that, but I feel I have much to be happy about; my first "proper job", taking commissions, workshops and talks, moving into a bigger room and furnishing it with fine frippery and feeling cosy and content there, four years with my sweetheart, even managing my mental health well so it doesn't interfere with my life too much. It's not been a half bad year, really, but I am also very much looking forward to all 2016 has to bring. In this (Christmas) spirit, the final #secretsofselfpreservation potion reads "Be grateful and be proud". I have been offered so many breaks this year, and been surrounded by the most wonderful people. I am also beginning to like myself a little more, and acknowledge my achievements, and yes, I am proud of one or two of them. Which is awfully self congratulatory, but for someone who has as poor self esteem as I do it's kind of a big deal. Pip's handwritten message on the wrapping paper of one of my Christmas presents accompanies the embroidery in the potion bottle. My year has been better for having him in it, and long may that continue. Remember you can get (still!) involved too, via the hashtag #secretsofselfpreservation, by writing about a simple way you plan to, or already do, take care of yourself. 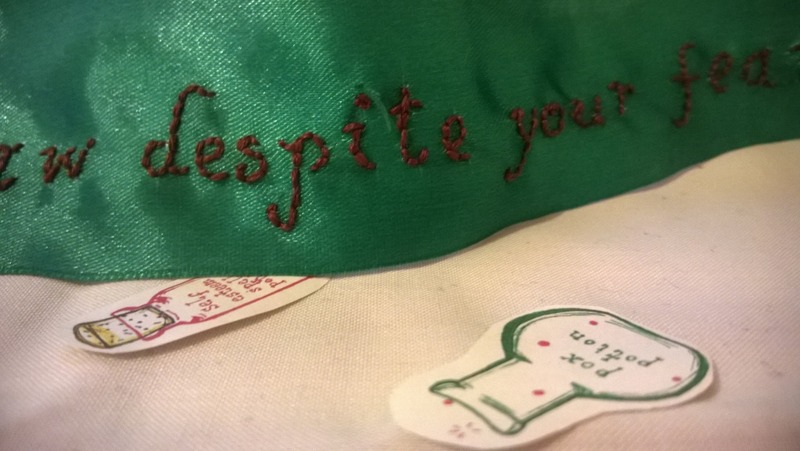 Alternatively, you can create your own embroidered (or written on paper) potion - just remember to include the hashtag #secretsofselfpreservation along with your snaps of it. Last week's #secretsofselfpreservation potion is not one but two days late to be posted, despite being finished in time. I'm feeling less and less inclined to blog lately; I don't know if it's wanting to hunker down and hibernate at this time of year, work becoming busier, or winding down with #secretsofselfpreservation as the end of the year draws nigh. I'm eagerly anticipating my next big project, but as last week's potion advocates, I must have "Patience." I've always been one to want to run before I can walk, but I'm learning to accept my limitations and take my time, and, crucially, wait. To accompany the text is what can only be described as fluff. I spent a good part of Saturday evening picking bobbles out of a new (old) angora jumper I had picked up for two quid, so that I could wear it the following day. In addition to that small example of patience, I had found a number of similar jumpers in Brick Lane for around thirty pounds a piece, but had decided to forgo them, so my patience really paid off! Last week was a bit of a boozy one. The weekend brought my little cousins to stay, the eldest of whom is obsessed with giraffes, and so it only seemed right to combine the two themes of the week in the diaristic element of its #secretsofselfpreservation potion with a giraffe shaped cocktail glass accessory. I named the potion Powerful Concoctions Potion, due to the alcohol consumption and the fact that I do believe these potions constitute powerful talismans and the process of making them plays a significant part in keeping me well each week. 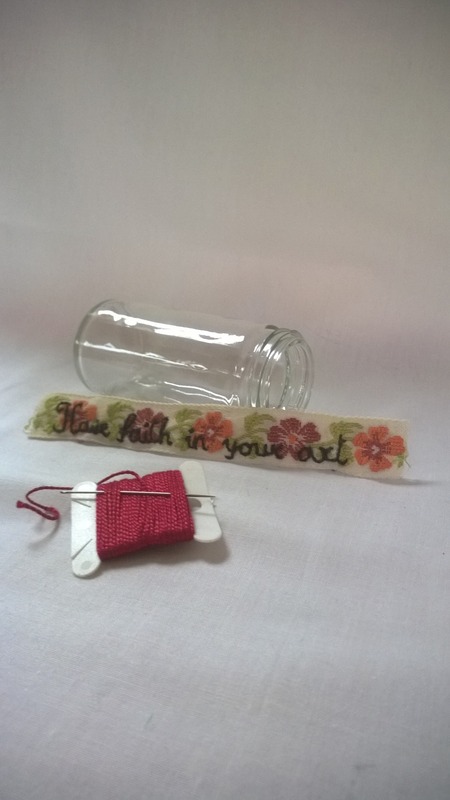 The words embroidered on the ribbon read "You are good enough." I am gradually beginning to believe that more and more. Perhaps my biggest flaw is my lack of willingness to compromise. I like things the way I like them, and I have a tendency to be all or nothing; if things are almost perfect, but not quite, I'm prone to pack it all in. At my worst I remind myself of the titular character from Kissing Jessica Stein; so terrified of things not being Perfect that she misses out on things being Quite Good. I have particularly been feeling this way lately, but if I think about it I must concede that things actually are Quite Good. 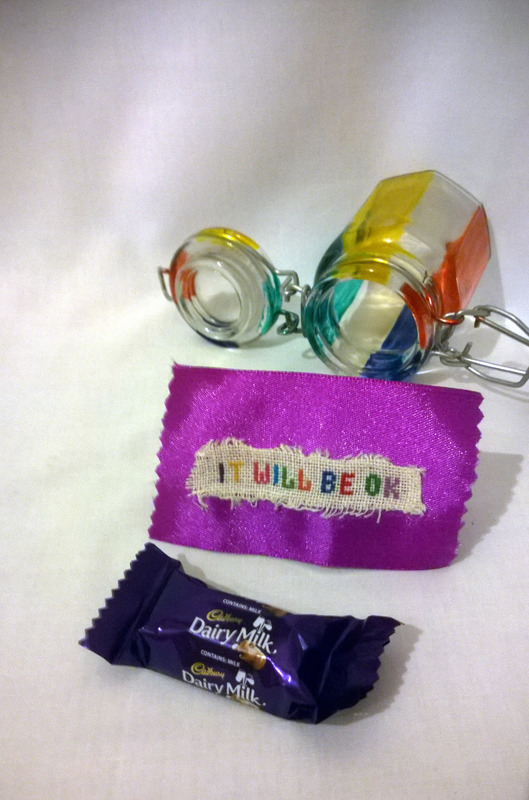 "Perfection is unattainable", as I embroidered on to ribbon for this week's #secretsofselfpreservation potion. I really want to remember that, and not judge myself so harshly, or at all, for not reaching the impossible. As the ingredients to go alongside this mantra, I have included 25p, simply because after our date yesterday my lovely boyfriend treated me to a rabbit themed mug for that price when we wandered into the local Sally Army. I'm nuts for bunnies, my favourite mug he got me some years ago tragically broke, and it was the kind of tiny gesture which makes me very happy. Our date was a trip to the Bob and Roberta Smith exhibition at the William Morris Gallery followed by coffee and cake. I have borrowed from Bob and Roberta's visual vocabulary, using a colour combination and font for the mantra which he frequently uses in his signs and placards. The potion's title is Owning Your Okness Potion, a reference to a Simpsons episode in which Homer reads a pamphlet by that name. I'm not very good at living in the moment. I have a very noisy and often unhelpful mind that, when I am trying to concentrate on doing the task at hand to the best of my ability, has a tendency to say "Remember when you were doing [completely unrelated thing] and failed utterly at it?" or agonise over whether I will be up to doing the task at hand next week, or fixate on the seeming improbability of ever moving out of my parents' house. Welcome, my friends, to pervasive anxiety. So, I would like to live in the moment a little more, and in the rare instances when I am able to, it is sheer bliss. It was that way during the two sessions of paper-making I led with young people at work over the past couple of weeks. I was completely invested and engrossed in introducing the young people to a new and creative experience, and buoyed up by their enthusiasm. Fingers crossed there will be similar results next time I lead a creative activity with them! That's why this week's #secretsofselfpreservation potion reads "Be present." Not letting it all pass me by in a tangle of worry. Some of the paper I made is included too, embedded with sequins and sparkling thread. The potion's title is "O.K. O.J. Potion" as the bottle is a relic from the Sixties when orange drink was delivered in glass bottles direct to door alongside pints of milk. From the way it is described, I would guess this "orange drink" was full of E numbers rather than being a more wholesome orange juice, but it still has a perkiness about it that speaks of hope and fresh beginnings. The drink was marketed under the name SuKie SunKap, with a little cartoon orange lady, which is about as perky as you can get. It reminds me to savour the moment and the little things, such as simply really enjoying a glass of juice first thing in the morning. I am beginning to feel more hopeful about my future. It seems that whenever I'm beginning to feel a lull in my freelance arts work, I get contacted about a fantastic opportunity, and that's without seeking them out myself, which I am beginning to do more of. My "night job" may not be paying the bills yet, but I feel immensely privileged to be able to earn some money doing what I love. The lull also allowed me some time to work on personal projects, which has been great fun. However industrious the week has been, though, I always round it off with a #secretsofselfpreservation potion. Last week, prompted by fortune cookies handed out at the end of my aunt's 50th birthday celebrations on Sunday, I was reminded of my favourite cookie fortune; "The harder you work, the luckier you will get". So Week Forty Four's #secretsofselfpreservation potion reads "Spit, polish and elbow grease gets things done." A reminder to work hard, accompanied by a feather from my Halloween costume (I was Tippi Hedren in The Birds) as a reminder to also let my hair down from time to time. I am doubting myself ever so slightly less than I have done of late. So, the stitching this week reads "Have more faith in your abilities". This applies to every area of life; work; friendships; juggling swords. My dyspraxia aside, I feel more comfortable in my own skin, more sure of myself, and more ready to try doing the things I feel trepidatious about, but I know either must be done or I desperately want to do. The peachy pencil represents conquering my fears and proving myself to the only person I need to prove myself to; me. This time of year heralds some of my favourite things; Twin Peaks watching season, warming bowls of food, woollens, the colour orange in plentiful supply, hunting for mushrooms in the forest, and yes, leaf-peeping. I realise all this makes me sound like a Pumpkin Spice Latte acolyte (I've never touched a drop I swear), but I still think Autumn is somewhat magical. As yesterday was spent fungi foraging, it seemed apt to include sketches of mushrooms I made last week along with photographs from our family walk in Epping Forest as the diaristic element of last week's #secretsofselfpreservation potion. I finally bit the bullet and started drawing, and the results do not appear to be utterly catastrophic. It reminds me of a page from this visual diary entry and this #secretsofselfpreservation potion from back in March, which was about feeling the fear (of drawing terribly) and doing it anyway. I drew inspiration from one Ms Hermione Granger and embroidered "Fear of a thing is worse than the thing itself" on to autumnal ribbon. Because it so often is. The potion's label is from the first page of my altered book What To Look For In Winter. 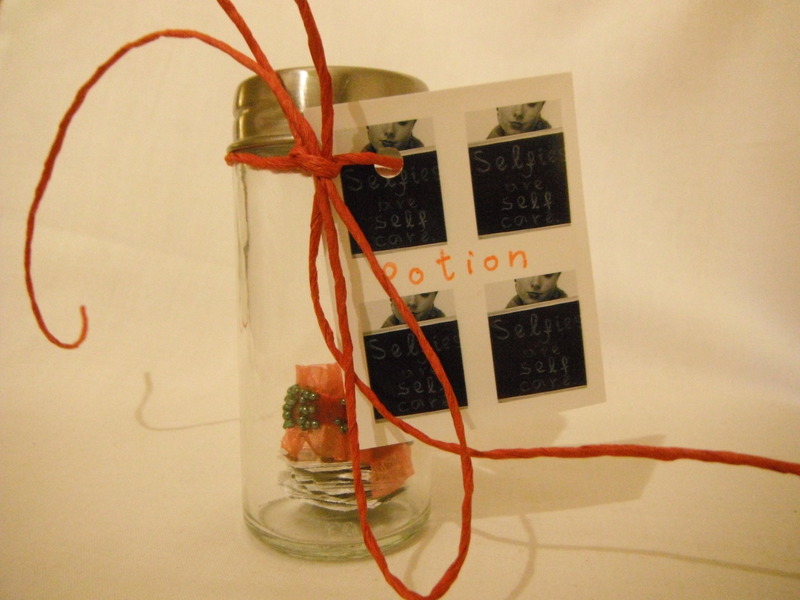 The potion's title is Sweet Kernel Potion, a reference to Keats's To Autumn, and to hope in the face of fear. Pip's correspondingly alliterative nickname for me is "Pine Cone". This is because I once sent him one in the post when I was "pining" for him... here, take this sick bag I prepared earlier. Sorry, we're unbelievably, unbearably twee. He brought me back three tiny perfect pine cones from a family party this week, so I thought a cone was a good start for this week's #secretsofselfpreservation potion. I have been struggling a little with self esteem and my sense of who I am this week. Initially I wanted to embroider the simple phrase "Come as you are", but I wanted to dispel any Nirvana associations. So I chose to stitch "You're fine as you are", which I'm sure all of us could do with being regularly reminded of. Particularly me. Remember you can get involved too, via the hashtag ‪#‎secretsofselfpreservation‬, by writing about a simple way you plan to, or already do, take care of yourself. 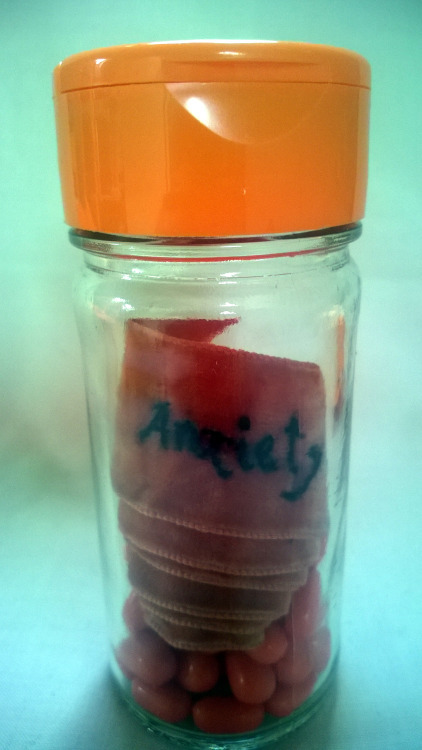 Alternatively, you can create your own embroidered (or written on paper) potion - just remember to include the hashtag #secretsofselfpreservation along with your snaps of it. On Saturday I arranged all my brightly topped potion bottles, assorted ribbons, thread, scissors, pens and needles ready for a #secretsofselfpreservation stitching workshop as part of the E17 Art Trail. My accompanying exhibition is up in the front window of Venue 68 up to and including this Sunday 14th June. Details are here. The ladies who joined me were perhaps tentative at first, but we soon shared some very personal stories and lots of self care tips. On Sunday, Sam Merkt came over for a mini workshop and to interview me about my practice as an artist who makes and works at home. Sam is studying at the London School of Economics and writing a dissertation on people who work in their home. A deceptively simple premise, but one with very rich seams; we spoke about everything from making the private public (both in terms of Tracey Emin's bed and hosting an exhibition and workshop in my parent's house), to house husbands, women's voices in the home as yet unheard becoming audible through the internet, the collapse of the welfare state to the rise of surveillance society. It was a fascinating conversation and a very enjoyable stitching session (even if I badly burnt my shoulders sitting in the sun!) and I am fascinated to hear what Sam does next and where her research takes her. Hopefully I will soon be doing more #secretsofselfpreservation workshops and the project will snowball; Erin is already thinking about what to stitch for this week, so I may have one convert already! This Saturday 6th June 2015 I will be leading a free workshop in the living room of Venue 68 in the E17 Art Trail from 4pm. 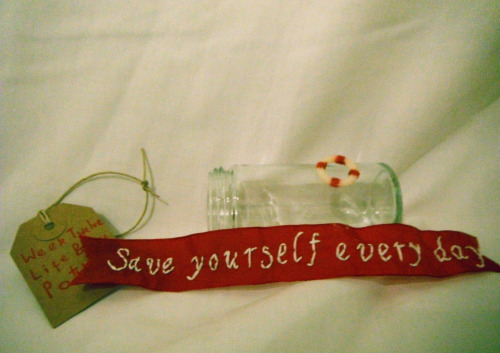 I invite you to uncork my #secretsofselfpreservation self care potions, and stitch one small way you already do (or perhaps could) take good care of yourself, to take home as a message in a bottle and a reminder to practice better TLC. There are 8 places remaining for the workshop.